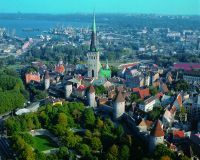 Not since Tallinn played host to the Eurovision Song Contest in 2002 has this stunning 1,000-year old city welcomed so many visitors as it did the 7th annual Routes Europe event (20/22 May 2012). Some 841 participated in total, including 168 airline staff from over 85 carriers; 370 airport delegates representing over 300 airports and supported by key players including IATA, the European Commission, Eurocontrol, ELFAA, Bombardier and aviation law firm Gates and Partners. Numbers were up 35% on the 2011 gathering meeting in Cagliari, Italy. Arriving to warm sunshine the hospitality afforded by the Tallinn hosts was impressive. Just missing the official Routes minibus on arrival from Luton with Ryanair (flight was fine and punctual, but the journey through security painfully long) one of Tallinn Airport’s staff offered to take our small group immediately to the hotel. But then it was apparent, hospitality shone throughout our visit – in the city’s Radisson Olympia Blu Hotel, venue for Routes, Swissotel where I stayed and the restaurants and shops too. It is a fairytale-like medieval town with centuries’ old cobbled streets. (The first Christmas tree ever was placed in its famous Raekoja Square in 1441.) It boasts gleaming shops, plush hotels, modern restaurants and cocktail bars. Wi-fi is available practically everywhere. This is the country – with a population of just 1.3m people (410,000 live in Tallinn) – that invented Skype. Wi-fi is free at Tallinn Airport and it was even available as a courtesy on the bus which took us out to the Gala Evening hosted by the Estonian Tourist Board and Enterprise Estonia. Hosts served up a fine intercontinental buffet and there was entertainment from stylish dancers in 1920s Great Gatsby dress, plus jazz band. And that was just the entrée to the 2,000 singers in national dress and orchestra who entertained guests at the Song Festival stadium. Vodka bottles nestled next to water and wine in the ice buckets. 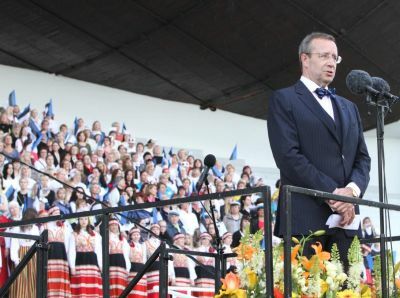 Estonia’s President, Swedish-born, US educated former diplomat and journalist Toomas Hendrik Ilves gave a welcome speech, trumpeting Estonia’s skill for innovation and e-lifestyle. After the dinner and Routes Europe marketing awards which saw accolades for Bremen, Brussels, Istanbul and Prague Airports, the partying began in earnest. Rock musicians took to the stage and dancing went on until the early hours, vodka shots on plentiful supply. 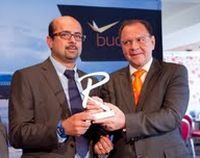 As Routes Europe 2013 host, Budapest Airport Aviation Director Kam Jandu summed up at the handover luncheon, Tallinn has really raised the bar this year. He promised that the welcome by Budapest and the Hungarian National Tourist Office would be equally as memorable when they host the event in 2013 (12-14 May). Routes Europe has become a popular and firm fixture on the commercial aviation calendar. On the opening day, Turkish Airlines announced it would be commencing three times daily services to Tallinn from Istanbul, following, it disclosed, years of negotiations at Routes Events. Spanish carrier Vueling also acknowledged the key role that Routes played in helping it decide to expand its UK services beyond Heathrow to Southampton and Cardiff Airports this summer. The largest of all the regional Routes events, run by UBM Aviation, this year’s Routes Europe programme was further enhanced with the introduction of Route Exchange briefings for airports. 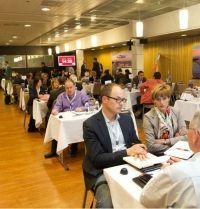 Participants included SkyWork Airlines, Volotea, Ryanair and Monarch. The introduction of a Routes Strategy Forum programme on the Sunday with a host of industry speakers was also well attended. “The Routes format enables us to meet 20 airlines in two days and the team does a terrific job in preparing online data on all the airports (via its Route Exchange online trading zone ahead of the sit down meetings) so the airlines are well prepared. It is very efficiently run,” commented Business Development Director at Oxford Airport, James Dillon Godfray. Airlines can choose to accept an airport’s invitation to meet, or decline. Airlines are free to approach airlines too. The Routes organizers then put the two parties together in 20-minute ‘speed dating’ slots. If there is serious interest, the work then starts back at the office, with follow up and fine tuning of market statistics. Bombardier has been attending the event for many years and finds taking an exhibitor stand very valuable. “Airlines who fly our aircraft or want to fly our aircraft come and chat with us about range and performance of proposed new routes. We had a lot of interest in the C Series this year,” said Jean Francois Guay, Airline Marketing Manager. Mitsubishi Aircraft was also present this year, but not with a stand. 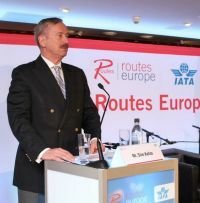 Siim Kallas, Vice President European Commission, responsible for Transport, speaking at Sunday’s Route Strategy Forum highlighted the need for more airports and more runways in Europe. Taking questions from the floor too, he said that regional airlines are focusing on developing their hub services rather than go point to point – a reaction to their businesses being squeezed by the low cost carriers and legacy carriers, he said. “An efficient, safe and reliable air transport system which links Europe’s regions with each other and the rest of the world is “vital for the broader European economy,” he noted. He stressed it is also just as important for regions to remain connected to Europe’s capitals – “so that we are both inclusive and competitive. We need airports to allow access to the more remote parts of the European continent, to boost the economies of the communities they serve. They already account for half a million local airport jobs and one million regional jobs. If a regional airport is to survive and thrive, it needs to go beyond the 'end-destination’ concept”. Host carrier Estonian Air, the largest operator at Tallinn Airport with 24 destinations in CIS, Scandinavia and Europe reported it enjoyed a terrific April with nearly double the number of passengers carried compared with the same period in 2011, with no impact on yield. “We are productive in many ways, but at the same time the biggest impact on our business is the value of the Euro, which has depreciated 15%. While our revenues are in Euros our costs are in US$ and we just cannot control this,” said Tero Taskila, President of the airline. Estonian Air is reinventing itself as a network carrier, focusing on improving connections between Estonia and the rest of the world with the aim of increasing competitiveness as a network carrier hub. According to Routes Online Magazine during the last summer schedule Estonian offered just 49 different flight options. However, since March this year 440 itineraries are now offered. New destinations include Helsinki, Riga, Jyväskylä, Hannover, Vienna, Venice, Joensuu, Kajaani and Tbilisi. The airline is also replacing its older B737s with Embraer E-Jets, four EMB-170s originally coming from Finnair and then two new E190s will arrive from 2013 in a recently ratified agreement with GECAS. “The E-190s will allow us to improve the schedule into longer destinations, like Paris, Amsterdam, London, and to open new destinations”, Tero Taskila said. He foresees the airline taking about 12 of the type.